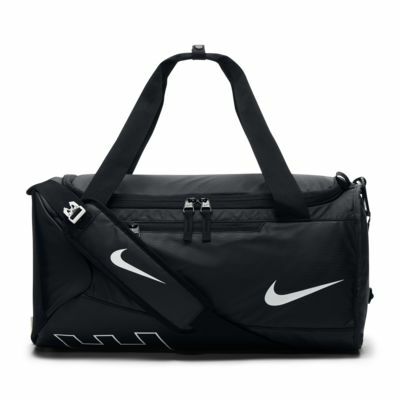 The Nike Alpha Adapt Big Kids' Crossbody Duffel Bag offers powerful durability and multiple carrying options for practice days or weekend trips. The Nike Alpha Adapt Big Kids&apos; Crossbody Duffel Bag offers powerful durability and multiple carrying options for practice days or weekend trips. The heavyweight polyester body makes the bag ideal for long-term use. The bottom features a polyurethane coating for added protection on wet surfaces. A vented wet/dry compartment helps keep you gear organized before and after practice. A removable, adjustable strap with Max Air cushioning gives you three carrying options: behind your back, over your shoulder or by the bag&apos;s dual handles. I like the size.... although it states as Youth Atheletes, good for ladies too! I can not believe what a bargain I got. I got this bag for around £11 in sale for my trips to the gym and I'm so happy with i, I love the fact that it has 3 different ways to be carried, plenty of compartments, a good size, lovely colour, good strong material and light weight. If your thinking about buying, just do it, you won't regret it.